Reconstruction gave black males (freed former slaves) the right to vote for the first time. This had enormous consequences for civil society. During Reconstruction and in the following years, eighty-six black men were elected to represent Arkansas in the General Assembly. Of the eighty-six, fourteen were elected from southeast Arkansas. Active participants in the legislative process, black legislators engaged in debate, introduced bills, and voted. They tended to support civil rights, education, public improvements, and immigration into the state. Black legislators from the southeast included the wealthy son of Chicot County’s largest planter; a noted abolitionist from Illinois; a former slave who became a college president and physician; educators; ministers; as well as men who eked out their living as farm laborers into the early 20th century. Laws designed to disenfranchise black voters (poll taxes, complicated election procedures and ballots), ultimately ended the election of African Americans in the late 19th century. Jones, Green Hill 1885 (H), 1889 (H) R b. TN (1842) Slave (TN & AR) Sharecropper, Farmer, Co. Treasurer, Co. Assessor, Slave on Kenneth Rayner’s Plantation on Grand Lake in Chicot County. Joined Comp F, 3 U.S. Colored Heavy Artillery in 1863. Educated at Hillsdale College, Michigan, 1870-1873. Adapted from Wintory, Blake J. “African American Legislators in the Arkansas General Assembly, 1868-1893.” Arkansas Historical Quarterly 65 (Winter 2006): 385-434. Between 1936 and 1938 the Federal Writers’ Project collected over 2,000 oral histories with former slaves. While Arkansas collected more histories than any other state, no interviews were collected in Chicot County. However, six narratives taken in cities across Arkansas are by former Chicot County slaves (or their children): Fanny Johnson, Nannie Madden, James Morgan, Lucretia Alexander, Nannie Jones, and Mattie Nelson. 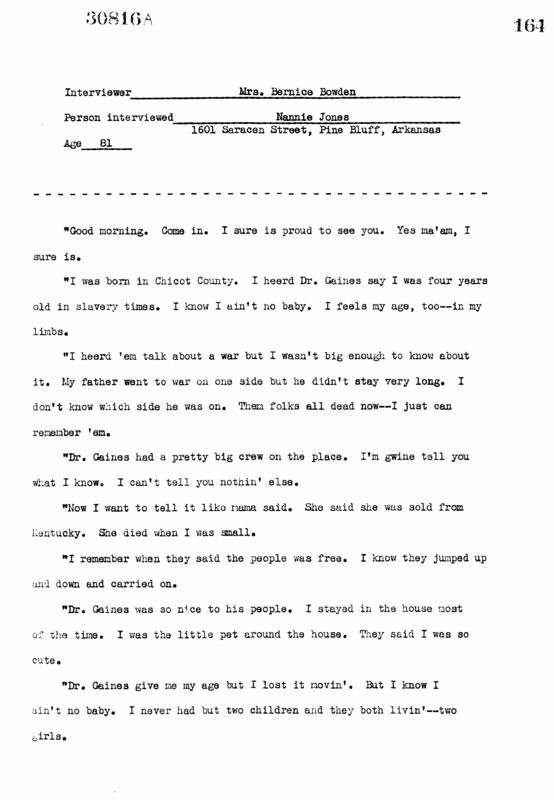 A seventh narrative by a former Chicot County resident, William Lattimore, describes his move from Mississippi to Arkansas. Fanny was too young to work in the fields during slavery, but she helped her grandmother take care of babies while the women work in the fields. After the war, they were taken (presumably by Federal troops) to the The Bend, Jefferson Davis’ former plantation near Vicksburg. She later returned to Arkansas, living and working in Jefferson County and in Oklahoma. She also worked as a cook in tourist towns like Eureka Springs and Hot Springs. Nannie Madden, interviewed in West Memphis at age 69, was born in Lake Village in 1867, just after slavery. It’s not clear from her narrative, where her parents were enslaved. Her father served in the Union Army, and after the war rented a farm at Red Leaf Plantation, then managed by Isaac M. Worthington. Her mother died there in 1876 and her father died in West Memphis at another daughter’s house at age 88. She stated, “I farmed and worked all my life.” Nannie recommended Booker T. Washington’s autobiography, Booker T. Washington’s Own Story of His Life and Work,and a biography, The Master Mind of a Child of Slavery–Booker T. Washington by Frederick E. Drinker. Morgan worked 35 years on the Missouri Pacific Railroad; 22 years as a foreman. He retired in 1932 and received a pension from the government for his work on the railroad. Lucretia Alexander, interviewed in Little Rock at age 89, was a 12 year old slave on the Rossmere Plantation in Chicot County when the Civil War began. She was born in Copiah County near Hazelhurst, Mississippi and arrived at Rossmere when she was “six or eight years old.” She remembered the plantation’s four overseers by name. The last overseer, Tom Phipps, was “mean…mean as he could be.” She recalled, “I’ve seen him take them down and whip them till the blood run out of them.” Once, he whipped her and “aimed to kill.” Protected by her mistress, Susan Chapman [Read], Phipps was run off the plantation. Lucretia’s mother and father were both born in Virginia. Her mother, Agnes Toliver, “was treated well during slavery times”; but her father was sold five times, because he “would take nothin’.” Later, Lucretia’s mistress purchased him for $1500 without ever seeing him. During the Civil War her mother stayed on the plantation because her children had been “refugeed…off to different places to keep them from the Yankees.” Lucretia’s brother returned in 1865, but she did not see her sister until 1869. While her parents were illiterate, Mattie went to school. But still work called. Mattie began working at age six, rolling logs and cleaning up new ground. Without her maiden name or her parents’ names, it was difficult to find more about her. However in the 1940 Census, she is still living in Pine Bluff. The 75 year old is a widow and taking care of her grandson, Fred Burt, age 9. William Lattimore, 78 years old when interviewed in Pine Bluff, likely only spent a few years in Chicot County. He was born in Canton, Mississippi in 1859. He remembered Yankees soldiers’ arrival in Canton during the siege of Jackson in 1863. His father joined Col Ziegler’s 52nd US Colored Infantry that year. William went to school after freedom and went until he married. It’s difficult to piece together a concise timeline. However, he moved to Arkansas, first Chicot County and then Jefferson County. He became a school director at 18 and was elected justice of the peace (probably in Jefferson County). There were three men with the last name Lattimore in Company G of the 52nd USCI–Reuben, Hilliard, and William. In the 1930 Census, a 65 year old William Latimer [sic] of Pine Bluff lists his father’s birthplace as Virginia. According to service records, Hilliard Lattimore was born in Virginia. However, in the 1900 Census a William Latimore in Chicot County, born in Mississippi in 1852, lists his father as born in Tennessee. The William Lattimore that served was born in Davidson, Tennessee. Further research into the soliders’ pension files would lead to more information. 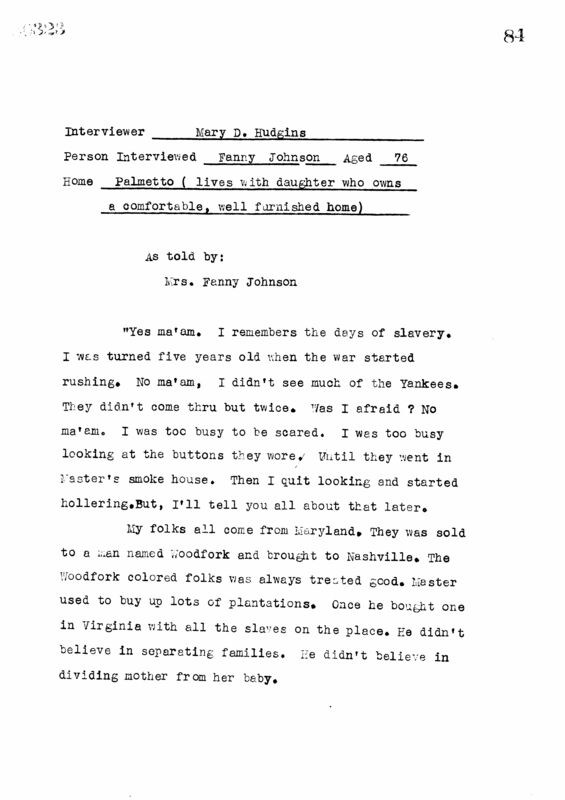 The full text of most of the WPA slave narratives are available on the Library of Congress’s Born in Slavery: Slave Narratives from the Federal Writers’ Project, 1936-1938.